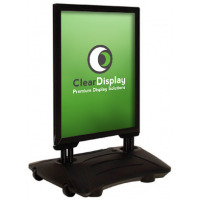 Now available as an alternative to silver, the black snap frame A-board gives you that option of choice on the shelf. Again, comes with heavier aluminium back panels making the unit stronger and more sturdy. 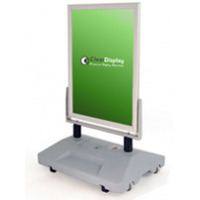 The elegant forecourt sign is a very strong and durable unit that supports a very large format print. 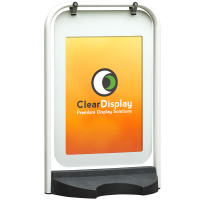 A high quality A1 Forecourt sign, with water-fill base. It has built-in wheels for easy movement and great stability. 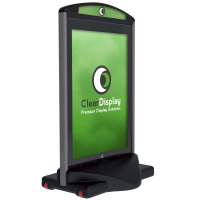 The Standard Forecourt is a competitively priced sign which has a large water fill base and snapframe poster holders. Time and time again people come back to this unit for it’s robust nature. It now comes with safety cornering and a rubber seal around the poster holder. 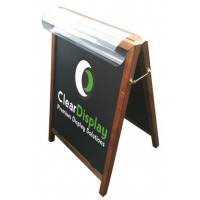 A high quality round a-board in poster sizes 20/30” and A1. 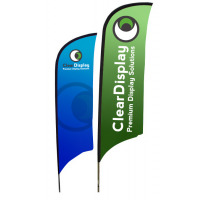 Tubular Steel construction with arched header panel and anti-glare magnetic poster covers. Finished in White. Black, Silve, blue and red also available. 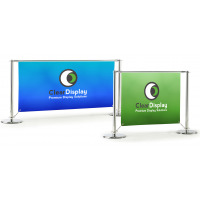 Cafe Barriers are ideal to create an outside eating, drinking or smoking area for your bar, restaurant, cafe or nightclub. 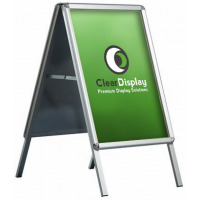 The Black Windpro forecourt sign is a high quality forecourt sign, ideal for retail sites, petrol forecourt stations, and small businesses. It is available in black in A1 size. One of the best looking pavement signs on the market! 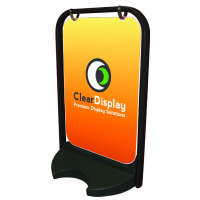 The basestyle swing sign is a high quality swing sign, ideal for business and retailers alike. One of the best signs on the market. The poster swing sign is an A2 Poster holding swing sign. 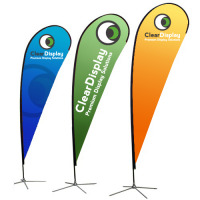 With a tough recycled PVC base, robust metal frame, and stainless steel hanging clips, the poster swing sign is ready for business. 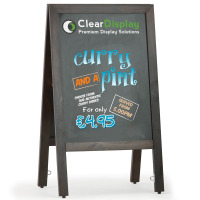 The Traditional Chalk Board is a high quality chalkboard with a classic feel, ideal for any pub, club, or restaurant. 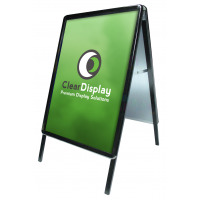 Available in small (panel size 650 x 470mm), or large (843 x 596mm), the Traditional Chalk Board certainly is eye catching.